June 7 2017. The USATF Masters Grand Prix consists of nine Masters National Championship races this year. 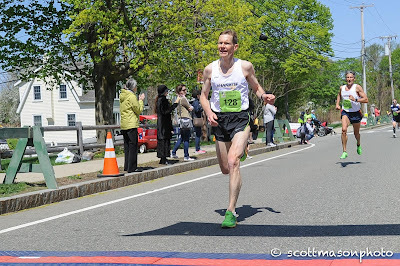 From January to May we had the USATF (Individual) XC Championships in Bend OR (early February), the 8K Road Championship in Virginia Beach VA (mid-March), the 10K Road Championship in Dedham MA (late April) and the Half Marathon Championships in Newport Beach CA (early May). After a hiatus extending over most of the summer, the Grand Prix resumes with the 1 Mile Road Championship in Flint MI (Friday evening, August 25), the 5K Road Championship in Syracuse NY (October 1), the 5km Cross Country Championship (October 15), the 15K Road Championship in Tulsa OK (October 28), and the USATF Club Cross Country Championships in Lexington KY (December 9). There are two components to the Grand Prix, an Individual GP and a Club GP. In the Individual GP, athletes accumulate points from 5 to 100 in each Championship in which they compete. To win a prize, the athlete must compete in at least 3 events and the athlete’s best 5 scores are summed to give their GP total points. Ties are broken first by a head-to-head comparison and then by number of age group wins. Who is leading the Grand Prix races in each division at the end of the first four events and what is the prognosis for the fall season? Men 40-44. The current top 5 include: David Angell (375 pts. ), defending GP champion, John Gardiner (190 pts. ), Orin Schumacher (160 pts. ), Jake Stookey (155), and Joshua Gordon (135). 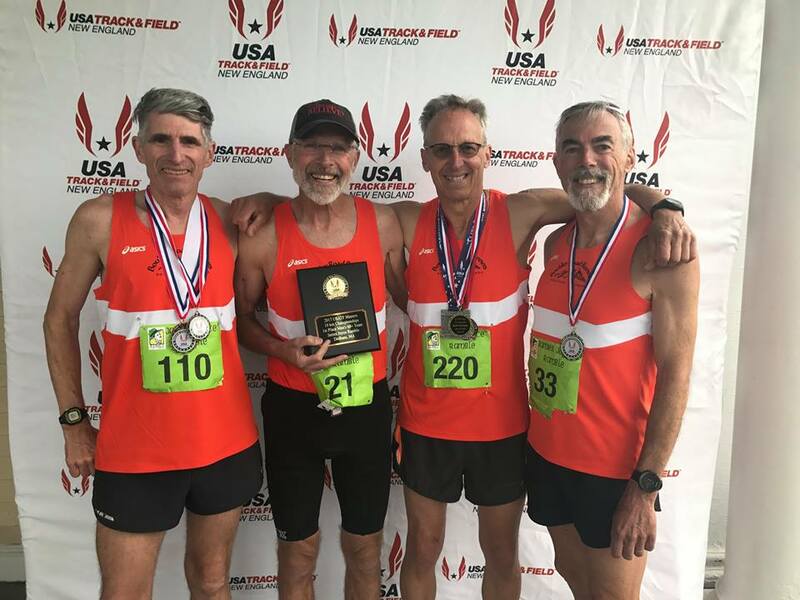 Angell’s large lead is due to his competing at a high level but also to competing frequently in the USATF Masters Championships. He has 4 championships in already; in those 4 races he finished 4th, 1st, 1st, and 3rd. One would expect Gardiner, the defending Champion in this group, to be his most formidable competitor. Gardiner came in ahead of Angell in the two races where they have gone head to head. But Gardiner will turn 45 in September; his points will follow him into the 45-49 category where he will compete for the 2017 GP title, not 40-44. So Gardiner is out of this GP race and in for the M45 GP. Schumacher and Gordon who both run for the Bowerman Track Club will, no doubt, compete in the Club XC Championships and so get the minimum number of races, it seems unlikely based on recent experience that they will compete in enough other championships to have a real shot at Angell. It would be fun to see them try. Running Tulsa and either Syracuse or Boston in addition would give them 5 races. Stookey may well accumulate the necessary number of races to compete but at least so far this year he is not at Angell’s level. One other runner who could conceivably catch Angell is Greg Mitchell, who missed much of the spring season to a hamstring injury. Mitchell won this GP title in 2015 and was runner-up last year when he first struggled with hamstring issues. If Mitchell can recover in time and run most of the fall races, he could catch and pass Angell. He would have to be at his best though, as Angell is a very tough runner. The only other worry on the horizon for Angell would seem to be if Jose Merino would decide to compete in a number of championships this fall. Merino came in ahead of Angell in the Half Marathon but there is no sign yet that Merino is interested in committing to the travel necessary to compete for a GP title. End-of-Year Favorites: Angell, Mitchell, Stookey. Women 40-44. Last year Melissa Senall and Wakenda Tyler, Genesee Valley teammates, battled with Stephanie Whitis, of the Atlanta Track Club for the Individual GP title as their teams were battling for Club GP glory. At the end of the year, Whitis, in her first year on the circuit, took 2nd, book-ended by Tyler who won, and Senall, the defending champion, who took 3rd. Strong runners like Janet McDevitt and Melissa Gacek won individual events but only competed in two events, not enough to qualify for a GP prize. So far this year no one in this division has run more than one event. Senall has aged up to the 45-49 division. Tyler and Witis have only competed in one event, the 10K at Dedham, where they finished 6th and 7th respectively. 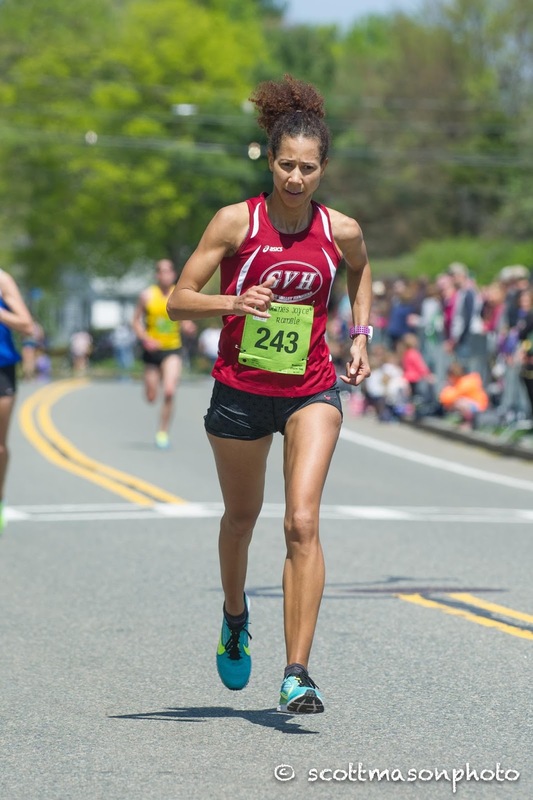 The GP leaders are the winners of the four individual championships: Melody Fairchild (Bend OR-XC), McDevitt (Virginia Beach 8k), Donna Mills-Honarvar (Newport Beach HM), and Ginger Reiner (Dedham 10K). McDevitt among those stands out because last year she cometed both at Syracuse in the 5K and at Club XC. If she would compete in those two events this eyar she would have her 3 events in and would be a contender. Among the 2nd place finishers Holly Ortlund and Heather Webster stand out because they sometimes run for teams that are active on the Club GP circuit so they have twice the incentive to race in a National Championship event. Ortlund, like Whitis, runs for the Atlanta Track Club; last year she ran only the 5K and the year before ran only Club XC so competing in three events would be a first. Webster ran in two events last year, the 5K and Club XC. If she added those two this year to the 10K she has already competed in, she would be a contender for GP honors. Kathy Wiegand in her first full year running for the Atlanta TC Women’s 40+ team could also factor into the race. She took 5th place at Dedham. Men 45-49. Because of a tie, the top 5 includes six runners: Steven Frisone, Brent Fields, Volker Burkowski, Brad Slavens, Matthew Farley, and Derrick Jones. But, as noted above, we should add Gardiner to the list; if he runs any races after mid-September he will be automatically advanced to compete within this group. None of the 6 listed will advance to the 50-54 group until after the last race of the year so they are all in the hunt. Gardiner is certainly the favorite to move into this group and take the title; he came in ahead of the current leader, Frisone, in the two races where they competed head to head. Fields, Burkowski, and Slavens will probably all get the three races they need to compete for an Individual GP title. But none of them have been able to stay with Gardiner in races where they have met. Cal Coast’s Michael ‘M.J.’ Stanley took the M45 GP title last year but has only 75 points for his efforts at the HM in Newport Beach this year. He will, no doubt, accumulate more points this year but will be hard-pressed to match Gardiner. Stanley was followed last year by his teammate, Christian Cushing-Murray, who won the title in 2015. Cushing-Murray carried an injury over from 2016 and will graduate to the 50-54 category before the fall season is over. In 3rd last year was Eric Stabb of the Atlanta Track Club. He may figure in the mix this year as well, but he will have to compete in at least 3 events in the fall; he currently has no points on the board. End-of-Year Favorites: Gardiner, Fields, Stanley [Burkowski, Slavens]. Women 45-49. Last year Sonja Friend-Uhl was both the dominant runner in the division and the only runner who competed in the necessary three or more events to qualify for a prize. Friend-Uhl ran and won the 10K, the 5K, the 5 km XC, and Club XC for a 400 point total. She runs for the Atlanta TC and was devoted to their cause in the Club GP race. Many of the women in this division, like the 40-44, have family responsibilities that make travel for Championships a bigger decision. This is especially true because these athletes can compete in a few high-profile non-Championship races as one of the top Masters runners entered [such as Carlsbad, Gate River Run, Freihofer’s 5K, and so on), often earn bigger purses than in our events, and achieve a certain amount of fame. This year the 45-49 division is looking like the 40-44 division. No one has more than one race. Friend-Uhl has focused more on track events and has no GP events in yet this year. That could change in the fall but as yet no one has signaled their intent to run enough events to qualify. The leaders in this division are the winners of the 4 events held thus far: Amy Halseth (Half Marathon), Cassandra Henkiel (10K), Grace Padilla (USATF XC), and Perry Shoemaker (8K). Although she only ran in one championship last year, Henkiel did run inn 3 2015 events, the 8K, the 5K and the 12K. There is no 12K this year but if she would run the 5K, she would need only 1 additional event and the 15K is actually closer to home for the Texas native. GVH’s Melissa Senall seems the runner currently on the board who is most likely to accumulate enough events to win the GP title. She won the 2015 GP title for the 40-44 group and finished third last year. Both years she competed in at least 3 events and it seems likely that she will do so again this year. Sonya Wilkerson, who favors the XC turf over the roads, has the USATF XC event in; if she would compete in Club XC this year as she did in 2015 she would need only 1 more event to qualify. 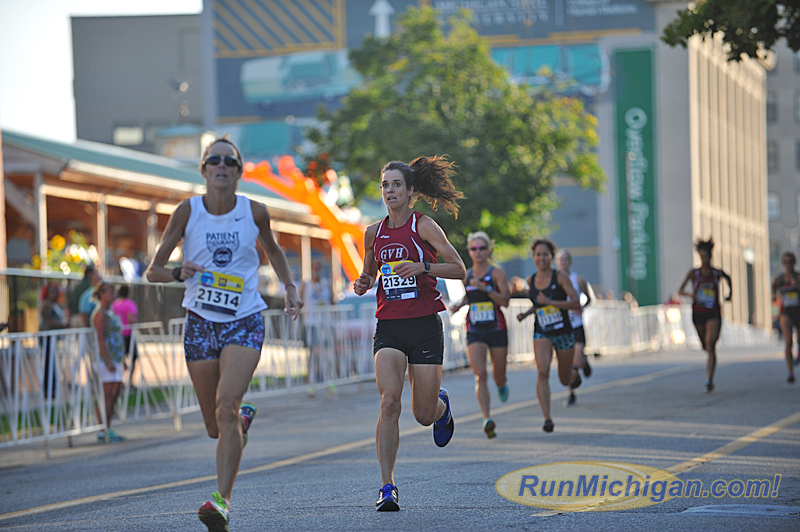 Melissa Senall (R foreground, with Alice Kessler] racing for the Finish Line at Flint. Men 50-54. Nat Larson of the Greater Springfield Harriers (GSH), Cal Coast’s Rob Arsenault, and Carl Combs of Club Northwest formed the podium last year with GVH’s Dale Flanders and Mike Nier just off the pace. Francis Burdett, who won in 2015, has been struggling with injuries the last couple of years; this year he has only one race on the board and he ran a far slower pace than his norm. Arsenault started the season off with a bang, picking up 100 points for a 1st place at Bend, but then got injured and is currently mired in 7th. He is sandwiched between Nier and Flanders so it looks like another very competitive year for the Men’s 50-54 GP. Combs got 95 points for a 2nd place at Bend but has not been able to make it to any further Masters Championships. 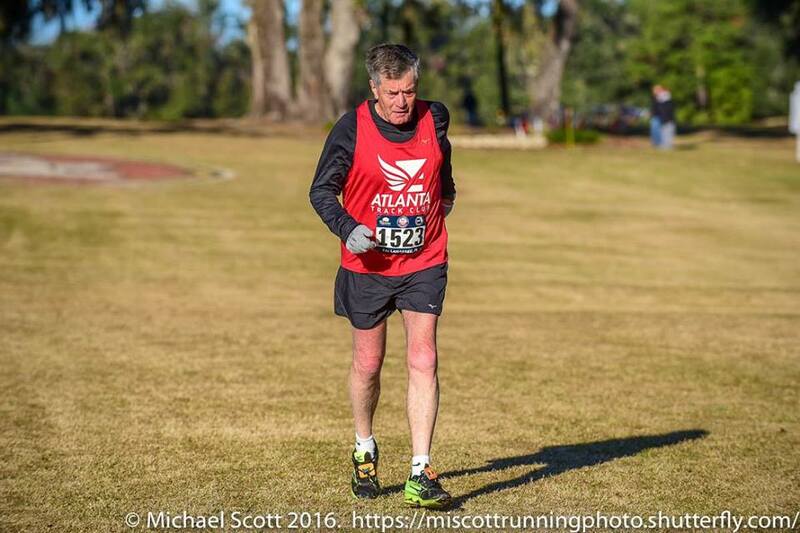 The Atlanta Track Club’s Kristian Blaich finished 6th last year, in part because he lost the spring season to injury. That injury is long behind him and he has piled up the points this spring in an impressive manner with age group wins at Virginia Beach and at Dedham. But it is a tough group at the top of this division; there are only 25 points between the leader, Blaich, Hoka NJNY Track Club’s Mike McManus, and the two GSH teammates, Kent Lemme, and Larson. As with the earlier age divisions, one of the leaders is off to a new age division however. Larson will age up to the Men’s 55-59 division this summer. In recent years neither Lemme nor McManus has competed in enough events to qualify for a GP award. That may change this year; if so there should be quite a battle this fall among the three current leaders. Kristian Blaich, turning onto the Boardwalk at Virginia Beach--3 miles to go! Women 50-54. In 2016 Marisa Sutera Strange, of the Athena TC, entered 5 events and won them all for a perfect 500 score. She won the Grand Prix by 125 points even though the 2nd place finisher, Kathleen Cushing-Murray, of the Jane’s Elite, is a very accomplished runner, taking a first, two seconds and a fourth place in her 4 outings. Third place went to Trish Butler who ran her first event, along with her New Balance Tampa Masters teammates in Syracuse. To wind up in the top three off of less than half of the season was quite an accomplishment. GVH’s Carol Bischoff and Kathleen Hayden took 4th and 6th while Cushing-Murray’s teammate, Kelle Taylor, finished in 5th. The top of the leader board looks pretty similar this year. Strange tops the list based on her wins in the 8K and 10K and her 3rd place finish in Bend on a slippery course. There is one complication; Tania Fischer is back on top of her game and, as Captain of the Jane’s Elite squad, has competed in two events so far, the USATF XC (6K) and the Half Marathon, and won both. The Jane’s Elite seem intent on challenging for the Club GP and, as a side product, Fischer will be challenging for the Individual GP as well. At one level Fischer currently has the edge in that she won at Bend. Apart from that, Strange and Fischer have not met. Fischer is already entered in the 15K at Tulsa. She and the Jane’s will surely compete at Club XC. Will they get in a 5th event at either Flint or Syracuse or Boston? Strange is on course to get at least 5 scoring events. Cushing-Murray, currently in 3rd, is not far off Fischer’s pace and could also factor in. Butler has been injured this spring and will probably not be able to compete for a top spot. Kathleen Hayden, Butler’s teammate, Michelle Allen, Taylor and Bischoff are all within 40 points of Cushing-Murray. Marisa Sutera Srange, closing in on the finish line at Virginia Beach! Men 55-59. Last year William ‘Hugh’ Enicks went after the GP title in this division and had it sewn up with two events to go. This year, he has not entered a Championship and is sitting at zero points. Kerry Barnett, from the Playmakers Elite/New Balance, won through to 2nd place on the basis of three fine runs at Flint, Syracuse and Club XC. He will need to do the same this year as he has not competed in any events yet this year. Last year the Marathon specialist, Fred Zalokar, won the Half Marathon and then rode a 4th place finish in Syracuse and a win in Tulsa to 3rd place in the GP. This year, Zalokar had to settle for 2nd in the Half Marathon, but is otherwise sitting about where he did last year at the same point. GVH’s John Van Kerkhove, with a win at Virginia Beach and a 5th place at Dedham, is currently in the lead. He has a slim lead over James Zoldy who netted a 4th at Dedham and a 3rd at Newport Beach. Timothy Riccardi with a 5th at Virginia Beach and a 7th at Dedham is next in line, not far off, followed closely by Gary Dworkin. Among those who have won events this spring in addition to Van Kerkhove, Kevin Broady and Derrick Staley seem unlikely to enter enough events to be a serious threat. In the past neither has entered more than 1 or 2 Championship events. Peter Magill, who won at Bend could be a real threat, but his Achilles tendon started acting up shortly after the lowered the 8K Record for Men 55-59. If he recovers relatively quickly he could still factor into the GP race this year but the GP will not be a major factor in his decisions about how quickly to return to racing. As mentioned above, it looks like Nat Larson, who is moving up from 50-54 is in the driver’s seat. Once he ages up, in June, he will move into a tie for 2nd in this division but should be favored to win each Championship he enters in the fall. Nat Larson, closing it out at Dedham with teammate, Kent Lemme, a few strides back. Women 55-59. GVH’s Colleen Magnussen took the title with 120 points to spare last year. Susan ‘Lynn’ Cooke, who finished 2nd last year, like her NBT teammates, only competed in the 2nd portion of the season. Atlanta’s Mary Sweeney was just 5 points back in 3rd. Athena’s Lorraine Jasper came on strong in the second half of the season to finish 4th, just ahead of Kelly Kruell who competed in the two West Coast events and Club XC. So far this year, Cooke is in 5th and Magnussen 7th. Athena’s Margaret Sloan did not compete in a USATF Masters Championship event last year but this year she has competed in three already and has the GP lead off of a 3rd, a 4th, and a 5th place finish. Her teammate, Doreen McCoubrie has celebrated her return to the USATF circuit with a first at Virginia Beach and at the Half Marathon, leaving her with the 2nd most points so far. McCoubrie’s teammate, Mary Swan, finished right behind her in the 8K and Half Marathon, accumulating 190 points and a tie with Laura Bruess, who finished behind those two in the 8K but took the win at Dedham. New Balance Tampa teammates, Cooke and Lesley Hinz, are tied for 5th. Jasper’s fitness is still not what it was in early 2016 but it was good enough for 3rd at Dedham. If her fitness continues to come along and she competes well in the 2nd half of the season, Jasper, currently in 11th, can be a factor in the GP race. The active engagement of Athena and New Balance Tampa in the Club GP gives all of the competitors except Bruess an extra reason to compete in a number of championships. Unless Bruess’s Athletics Boulder team would commit to contending for the GP, she lacks that extra incentive to compete in the USATF Masters Championships. Nonetheless, even without that incentive Bruess has been willing, so far, to make two East Coast trips from her Rocky Mountain home territory. It would be great if she would compete in a few more championships this year and contend for the GP title. Men 60-64. Last year Brian Pilcher stayed healthy enough to score a few points in the spring while recovering from his 2016 injury and smashed his way to 3 victories in the fall along with record-breaking performances. Gary Radford stayed the closest, finishing 2nd with his teammate, Mark Rybinski, finishing third despite various fitness issues. The three Cal Coast teammates, John Holcomb, Keith Witthauer, and Perry Forrester took the next three spots with Rick Becker in 7th. Becker netted three first place finishes in the spring but did not compete in the fall because of coaching responsibilities. Kyle Hubbart and Dan Spale finished 10th and 14th despite only running in the fall. John Barbour competed in two events and finished 13th. It looks like Spale and Hubbart can make a run for the GP title in their first full year of running for the Boulder Road Runners. Despite some foot issues, Pilcher was able to come within 7 seconds of the American Record in the 8K Championship but shortly thereafter noted that the foot had gotten worse and he would be taking time away from running. Becker had foot injuries at the beginning of the year, undergoing foot surgery in early March. Even if he runs well in the fall, the absence of any spring points means he will not be competitive in the GP. Rybinski has battled hamstring and other issues over the last year or so and is now taking time off from racing to try to get a full recovery in. Radford is running as well as ever and will definitely be a factor but so far Spale and Hubbart have the edge in head-to-head races. Despite being one of the stronger runners in the division, it seems unlikely that Barbour will compete in enough championships to factor in the GP. Radford is the current leader and has the edge in head-to-head against the Cal Coast guys. On the other hand, if the Half Marathon result is any indicator, Holcomb is running really well, much better than last year. If he is still feeling his oats in the fall and the Cal Coast team comes east a few times, he could definitely put pressure on Radford. Radford’s teammate, Kevin Clinefelter is currently in 2nd off of strong finishes in three events. Currently in 7th, Reno Stirrat has been battling a variety of issues over the last year and a half. If he can put those behind him, he will definitely move up in the charts! Women 60-64. 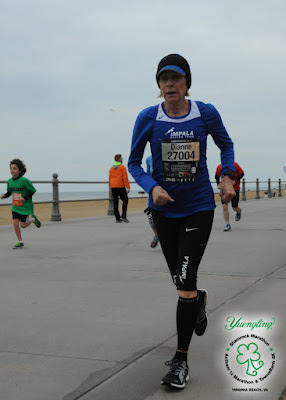 In 2016 Jill Miller-Robinett, of the Impala Racing team, competed consistently at the top of the age division. With two wins, two seconds, a third and a fourth place finish, Miller-Robinett won the GP with a margin of more than 150 points. Cynthia Williams and her Atlanta TC teammate, Cynthia Lucking had the same number of points from their 4 races, but Williams got 2nd on the tiebreaker. Their teammate, Margaret Taylor only got three races in and finished 4th. Her teammate, Terry Ozell was 10 points behind in 5th. Honor Fetherston and Nancy Stewart ran well, with Fetherston taking first in the 8K and the Half Marathon and Stewart claiming gold in the 10K and 5K. But neither fitted in the third race needed to qualify for a GP prize. 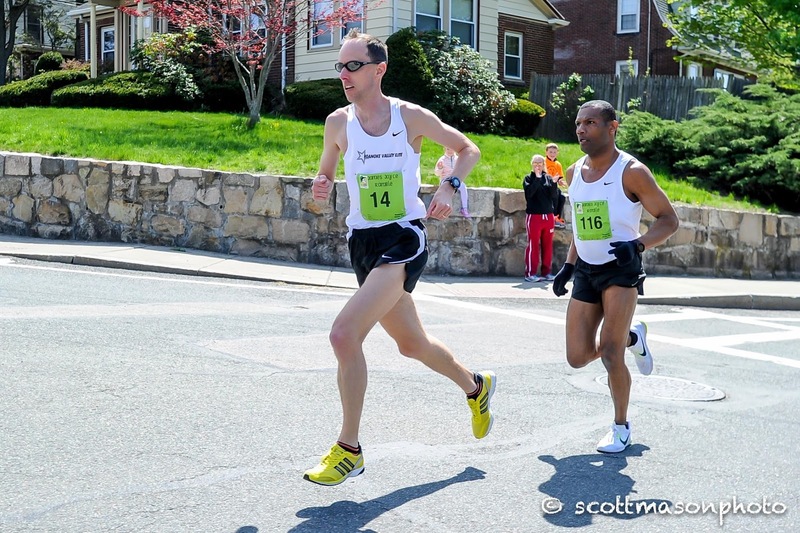 The Impala’s Mo Bartley did almost as well snagging a 2nd at Dedham and a first at Club XC. This year a lot of those names are towards the top of the leader board but there are some significant changes. The Impala’s have been battling injuries and so, unlike last year, skipped the 10K and Half Marathon. As a result, Miller-Robinett has only two races in the first half of the year and sits in 2nd, 10 points behind Team Red Lizard’s Joanna Harper. Then comes the Atlanta TC crew, with Taylor tied for 2nd, Mary Richards 5 points back, the two Cynthias, Williams and Lucking, 5 and 25 points, respectively, behind Richards. Susan Stirrat and Sharon Moore, are tied for 7th. Bartley has 100 points from her 8K win but will need a few more races in the fall to factor into the GP contest. Harper, despite her current leading position, may not compete in enough championships to qualify for a prize. In the last two years she has competed in one Championship one year and two the other, both on the West Coast. So she may be done for the year. Men 65-69. Last year Doug Bell and Peter Mullin battled to the last race of the year. Bell took the early lead, besting Mullin at the 8K and 10K. But then Mullin roared back with 1sts in the Half Marathon and 1 Mile; Bell did not contest those. When Mullin also edged Bell in the 5K it looked like Mullin might win through. 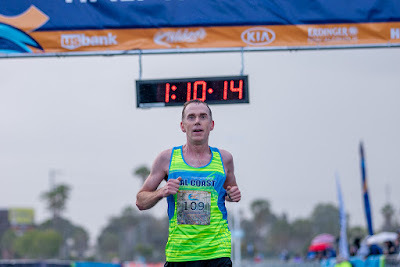 But Mullin was not able to compete in the 15K, the final Road Race of the year and generally does not run XC. Bell is a veteran XC country runner and relished the opportunity to finish strong. He even beat his old nemesis, Doug Winn, in Club XC to take 100 points n the final event of the GP and win it by 15 points! Winn either won or placed 2nd in each event he contested but 3 events is not enough for the GP title in this division. 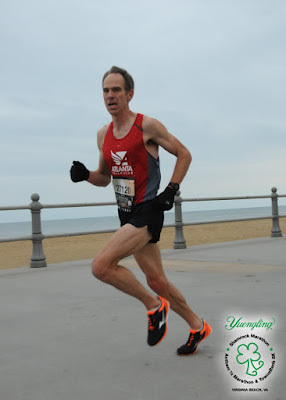 Tom Bernhard brought 95 points with him from the spring season of competing in the 60-64, broke the American M65-69 record in the 5K, and won two other events, but 4 strong runs is not enough in this division either. Kirk Larson ran 5 events, finishing somewhere between 2nd and 6th in each one and that was enough to claim 3rd place in the GP. He edged his teammate, Jerry Learned by 15 points for that honor. John Hirschberger competed in only one evnt last year, the Club XC championships. He must have enjoyed the experience. He is back with a new age group and a new purpose. He has competed in all 4 events so far this year and has performed very well, with a 2nd, a 3rd, a 5th, and a 7th. As a result, he is in first place, with Mullin in 2nd. But make no mistake. Mullin is going all out for the GP win. Even though he wanted to compete in the Half Marathon at the World Indoor Games in Daegu, South Korea, he made time to compete in the 8K Championship in Virginia Beach right before he left for Korea. There were three road races in the spring and he ran all 3, edging Bell in the 8K and 10K and winning the Half Marathon again. Mullin will most likely be aiming at the 1 Mile, 5K, and 15K in the fall; but those are also te races that Bernhard is likely to target, meaning that Mullin is likely to score only 95 points, at best, in each of those. Bell will most likely target the 5K, 5K XC, and Club XC. If so, the 5K will be a showdown between the two that may well determine the outcome of the GP race although if Bell wins, the pressure will be on him to deliver the points he needs in the last 2 XC races of the year. Bernhard has 200 points on the 8K and 10K he has competed in this spring. If he runs and wins the 1 Mile, the 5K and the 15K he will have 500 points and will win the GP. If Bernhard wins through then the epic struggle between Mullin and Bell would be for 2nd place, no less of a struggle for that. Unless one or more of these hardy veterans encounters fitness issues, it is unlikely that Hirschberger can make the GP podium. The same is true for Lloyd Hansen, Runner of the Year in this division two years ago. 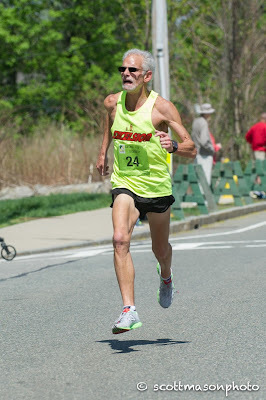 Hansen just turned 69 and it is tough to make the podium in your last year in an age division; that difficulty is compounded by the fact that Hansen is coming back from a sciatic nerve problem that severely reduced his training efforts. The 70-74 division will have to watch out for him next year when he ages up. William ‘Bill’ Dixon, another terrific runner, ages up sometime between May and August of this year. He has shown less inclination to race much on the circuit. 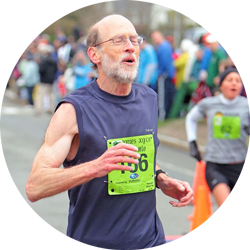 In many years he runs only the 5K in Syracuse and the 10K in Dedham, both within driving distance of his home in Vermont. He does occasionally run for his team at Club XC also. When he races he is tough to beat. Even if Dixon does not race in enough events to compete for a top GP prize, he always has an effect on the GP outcome by limiting the points that other competitors acquire in those events. Larson and Learned are both running very well and each is ahead of his point total for last year. They will probably both accumulate over 400 points again. That keeps everyone on their toes. Last year it took 410 points to beat the 4th place finisher; this year it is likely to take more. Women 65-69. One would think that Edie Stevenson who took 4 firsts and a second in 5 starts would have run away with the GP title. Her only loss was at the hands of Kathy Martin’s American Record smashing run at Syracuse. But she won by only 20 points as Jo Ann Rowland had a first, three seconds and a third place. Rowland’s Impala teammate, Donna Chan finished third. Sabra Harvey, Catherine Lempesis, and Kathy Martin all had winning efforts at one of the championships but none entered the three races needed to qualify for a GP prize. In 2017 things look a little bit different and a little bit the same. Team Red Lizard’s Jeanette Groesz is atop the leader board with wins at Bend and Newport Beach. Stevenson sits in 2nd 5 points back with a win at the 8K and a second to a record-breaking performance in the 10K by Sabra Harvey. In most years, Stevenson would have competed in the Half Marathon Championship and gone head to head with Groesz. 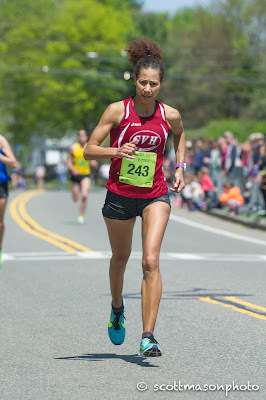 But this year, after winning the 8K in mid-March, lowering the listed American record in the Cherry Blossom 10 Miler in early April, and contesting the 10k Championship on the 30th of April, Stevenson decided it would be pushing her luck to run the HM just 1 week later. GVH’s Cindy Ingalls and Jeanne Herrick have come in right behind Stevenson in the 8K and 10K and now sit in 3rd and 4th respectively. Harvey has a hundred points from her win at Dedham. Last year she competed only at Club XC but in 2015 she ran in the 1 Mile and 15K championships in addition to Club XC. She has already signed up fpr the 15K and has expressed interest in running the 5K at Syracuse. If she would run those as well as Club XC she would certainly be a major factor in the GP race. It will be interesting to see what Groesz does. She, too, is entered at Tulsa. If she runs the 15K and then runs with her Red Lizard teammates at Club XC, she would be in the mix. Rowland and Chan are currently struggling with injuries so it is unclear how much they will be able to compete in the fall. Men 70-74. Last year’s main contenders were defending champion, Jan Frisby, Paul Carlin (yours truly), Przemek Nowicki, and Gary Patton. Nowicki and Carlin had finished 2nd and 3rd to Frisby in 2015. Frisby started the season with fitness issues and never got totally on track. As a result he was playing catch-up all year and finished 4th. Patton, a terrific track runner, had competed only in a few road races here and there over the years. But he hatched a plan to give it all he had for a GP victory in his first year in the new age division. He would only have to run in one race longer than 8K. If he raced at Bend (8km XC), Brea (8K road), Dedham (10K road), Flint (1 Mile road), Syracuse (5K road) that would give him 5 races and a definite shot at the title. As it turned out, Patton won at Bend and just nipped me in the final 100 meters at Brea. I came back with a nice win in the 10K at Dedham but Patton chugged in to take 2nd so he was still ahead and 1 up on head-to-head competition. Patton would surely beat me at the mile. The only chance I would have had was to beat him in Syracuse and/or win enough events to outdistance him in points. But I had apparently overdone the training in the run-up to the 10K as a week after Dedham I found I could not run without pain. Three months of Physical Therapy took me out of contention as I jogged at Flint, ran okay at Syracuse but finished far back. When I also struggled at Tulsa, that pulled me out of the 5km XC and gave Nowicki a chance to take 2nd place if he ran well. He did; Nowicki took 2nd and I got 3rd for the second year in a row. Patton, of course, took first by 30 and 35 points respectively. This year I am also in recovery mode but I vowed to take it more gradually this year. So far that has worked. I am aided by the fact that Patton is sticking to the track this year, Nowicki has been out injured, and Frisby continues to have fitness issues. My main worries were Gene French, Dave Glass, Richard Kutzner, Jim May, and, to my surprise, a newcomer on the scene in Tony Gingello. French got off to a quick start by competing at Bend; none of the other contenders did. That gave him a 95 point lead. May ran tough at the 8K, netting 100 points for 1st. Behind him was me, French, Marc Bloom, Kutzner and Frisby. Bloom would also be a runner to reckon with but he has not, traditionally run in enough GP events to threaten for the podium. That gave me a head-to-head victory over French and Kutzner which might come in handy later in the year. I saw that Glass was entered at Dedham. I initially figured he was the favorite as he beat Jim May in the 5K last year and May beat me in the 8K. Glass had strained a muscle in the run up to Dedham so he was not at his best. I also learned after the race that May had strained a muscle cross country skiing a week after the 8K at Virginia Beach. But May had recruited a new tyro for GVH, Gingello. And Gingello took the win, passing me and holding me off in the last 200 meters or so. Behind me were Kutzner, Bloom, Frisby and Glass. French was in the Bay area of California prepping for the Half Marathon to be run the following week. That left me in 1st, but only 5 points up on French, 10 on Bloom and Kutzner, 15 on May, and 25 on Frisby. Gingello and Glass were on the board but with 100 and 65 respectively, they were far back. 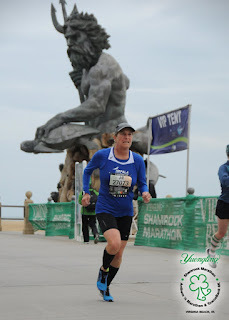 To be honest, given my injury experience over the last couple of years, I had a little trepidation about racing in the HM only 1 week after the 10K. But I figured I needed it and if things were off, I was determined to pull back and run it as a training run. As long as I finished the race at training pace, I figured to score pretty good points. It turned out much better. Kutzner won last year but I was able to catch him between miles 9 and 10, pass and eventually pull away for the win. Kutzner took 2nd with French 3rd; none of the other main contenders competed in California. It is definitely anyone’s game at this point; I am 15 points ahead of French and 25 ahead of Kutzner. Given my propensity for injuries over the last two years, nothing is certain. And if any of the contenders is on their game, there is time in the fall to rack up enough points. With five events, a dominant runner can score 500 points and take the title. As I mentioned in the 65-69 discussion, Bill Dixon is aging up this summer and has the talent to score 500 points in 5 events if he decides to contest 5 events. That would be uncharacteristic, but as I learned last year from Patton, expecting the unexpected might be the smart way of thinking. Gingello will surely run Syracuse which is close to home. How many other events will he run? And Jim May and Dave Glass can come back. May does not usually compete in longer road races like the 15K so he probably only has 4 races he would compete in. But those 4 could leave him with a ton of points if he is fully recovered. The same goes for Glass. And if Nowicki is fully recovered, he will have a say in many of those races. This is one of the most competitive divisions as far as the GP goes. Women 70-74. The Impala’s Dianne Anderson took this GP title last year with a margin of 190 points. Irene Terronez took second place. Norma Thomas won two events but never got the third required score. Other top Event finishes were recorded by Jan Holmquist and Ruth Thelen but neither competed in two additional events to compete for the Individual GP title. This year things are looking similar. Anderson is again at the top of the scoreboard with a first place at Bend and a second place at Virginia Beach. 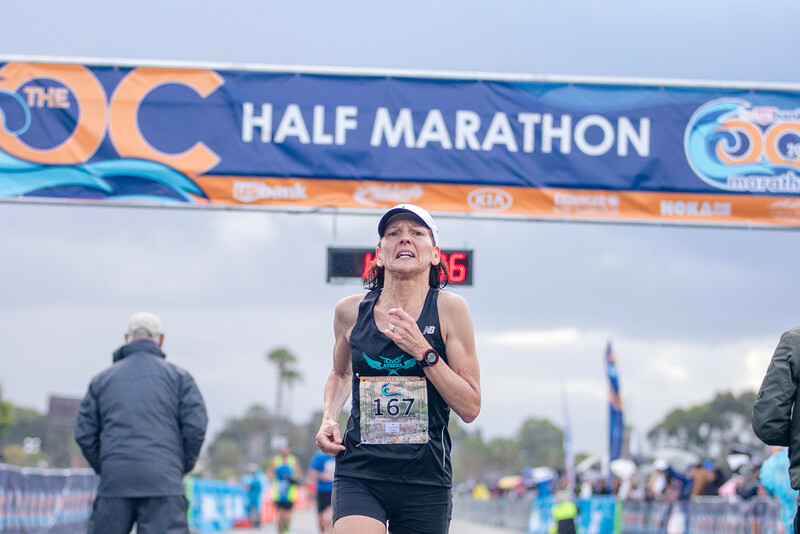 Terronez is in second place, only 5 points back, with a win at Newport Beach in the Half Marathon and a third place finish at Virginia Beach. Holmquist has her win at Dedham but nothing else. In past years she has often competed at Syracuse. If so, she would need only one more event to qualify for a GP prize. 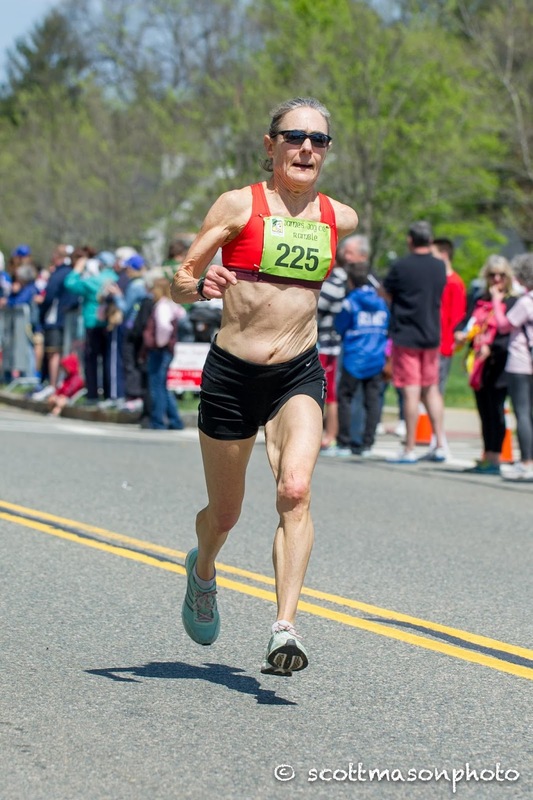 Perhaps the 5km Masters XC Championship in Boston, not far from her hometown of Burlington MA will be enticing and she will be in the hunt for a prize. Kathleen Jefferson took the win at Virginia Beach. Jefferson has not been active in the Masters Grand Prix before this year. 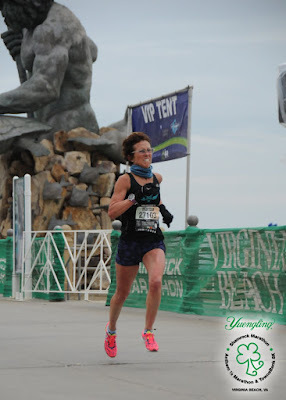 Will her triumph at Virginia Beach encourage her to travel a little further from her Virginia home to compete in the 5K at Syracuse or perhaps the 1 Mile at Flint Michigan? Time will tell. Men 75-79. Despite struggling with injuries the second half of last year, Ron Mastin took the GP title in this division with a 95 point margin of victory. Phillip Kroll, Andrew Sherwood, and Al Swan followed in that order. Mastin has not competed yet this year. Many of us knew that Doug Goodhue, who was plagued by injuries last year, would age up. We hoped that the 9-time Runner of the Year would have put his injuries behind him but it has not turned out that way. Goodhue has also been unable to compete. Sherwood, on the other hand, has competed in all 4 events this year and has won at Bend and at Newport Beach. That is enough to put him at the top of the leader board. Swan has competed in 3 events, taking 2nd at bend, to sit in 2nd place in the GP. Sherwood has the edge over Swan, however, having finished ahead in each of their 3 head-to-head contests. 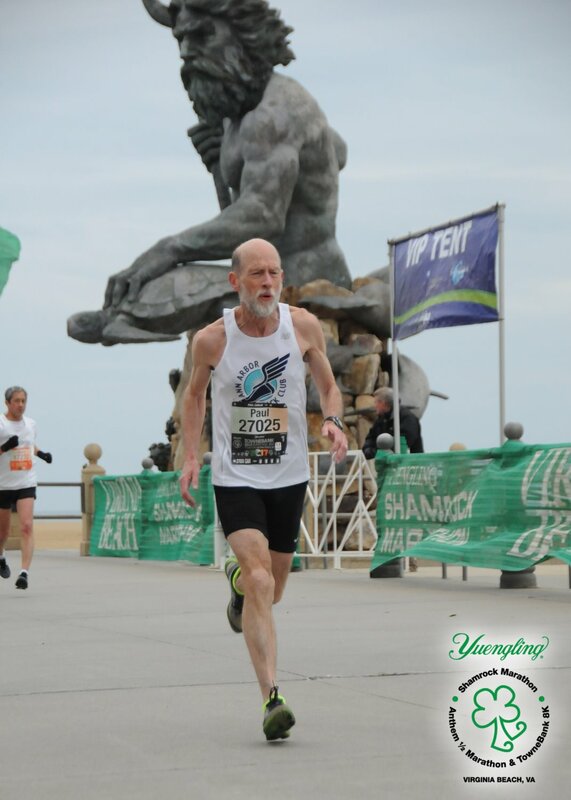 Malcolm Cohen, who finished 11th last year in the 70-74 division, has aged up and, having competed in 3 events, sits in third place. His teammate, Phil Kroll, who has competed in 2 events, is right behind in 4th place. David Turner and Tony Fiory who finished 1-2 at Virginia Beach, could factor in if they run a few more events in the fall. The same is true for John Noyes and Hal Bennett who took 1-2 at Dedham. And it goes without saying that if either Goodhue or Mastin can put their injuries behind them, there are enough events in the fall for them to move swiftly up the leader board. Women 75-79. 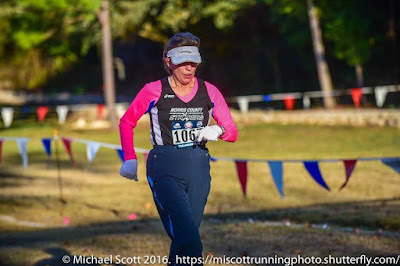 Last year Madeline Bost ran at the 8K in Brea, and then not again until the last two Championships of the year at Tallahassee, the 5km Masters XC and the Club XC Championships. With two first place finishes and a 4th place, Bost amassed 285 points and took the crown. Pat Herr, Kathy Kusner, Ellen Nitz, and Margie Stoll each won one event but none of them competed beyond that one championship. Things are looking good for Bost’s strategy at the moment. Her 90 points from a third place at Virginia Beach leave her currently in 4th place but none of the folks ahead of her have more than one race in. Joanne Markley picked up the win at Virginia Beach and Kathleen Scotti got the win at Dedham. Judy Stewart’s 2nd place at Virginia Beach leaves her currently in 3rd place in the GP. Bost has been challenging other runners in her age division to step up their game by competing in a few more events but so far there have been no takers. Bost has competed at Syracuse in the past and may do so this fall. If she also competes in the 5 km Masters XC at Boston, that would give her the 3 contests she needs. She could then wait to see if a trip to Lexington KY for Club XC is necessary for a win or not. Men 80-84. Jon Desenberg ran 4 events last year and captured the GP title. 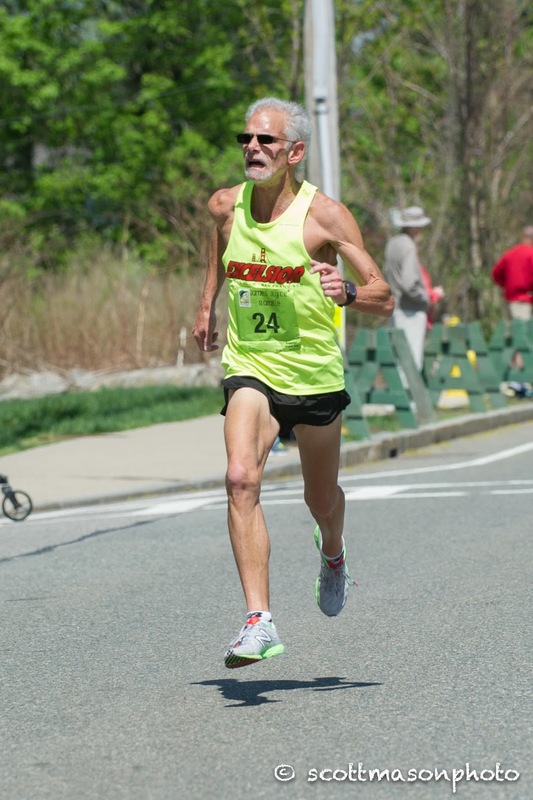 Although other runners inthis division ran well when they ran, like Jim Askew, Bill Dodson, Bill Spencer, Wade Stockman, and George Yannakakis, none competed in the 3 events needed to factor into the GP contest. Desenberg has not competed yet this year and may not be planning on contending for the GP. Duane Lougee won at Virginia Beach, William Riley at Dedham, and Richard Williams at Newport Beach but no one has run in two events yet. Lawrence Cole, who finished 3rd at Dedham, has expressed some interest in competing at Tulsa. If so, that would give him 2 of the 3 events he needs to win a GP prize. If he would also compete in the 5 km XC Championship closer to home at Franklin Park in Boston, he would be the favorite for the title. Of course it is worth observing that 3 of Desenberg’s 4 races last year were in the fall, the 1 Mile, 5K, and 5km XC championships. If he runs in all three of those again, he could take the title.